Aspiring teacher and school principal Thomas Smith overcame childhood cancer to become a leader in high school and now at Middle Georgia State. Full Name: Thomas J. Smith III. classroom, athletically and in the community." Family: Parents, Thomas Smith and Diannia Smith, and siblings, Trenton Smith, 11, and Taylor Smith, 7. Degree Objective: Bachelor of Science in Early Childhood & Special Education. Activities: MGA Brothers of leadership and Distinction (BOLD) - Academic Excellence chairman; Peer Career Advisor- Cochran Campus president; and RA on the Cochran Campus. "I am currently working to be inducted into the National Society of Leadership and Success." Career Goals: "I would like to start off teaching in an elementary school setting. Later I'd like to get a master's degree in leadership and move up to administration and become a school principal." He chose Middle Georgia State University because … "I wanted to go to a smaller university so I would not be overwhelmed in my classes. Also, I wanted a chance to be a part of a new university and help make it great." 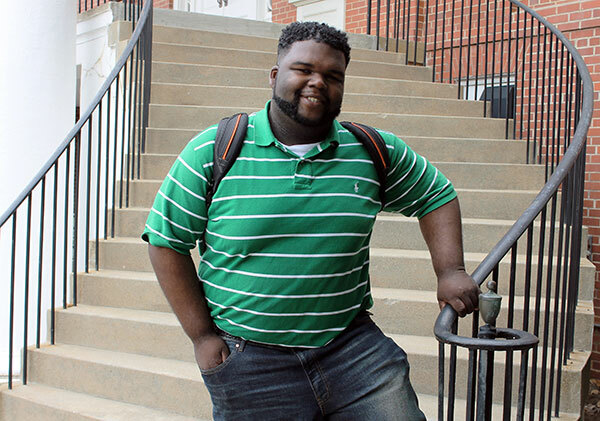 The greatest thing he discovered about Middle Georgia State after enrolling was … "You get the opportunity to develop relationships with the faculty, who go above and beyond to help you succeed." His greatest academic experience as a Middle Georgia State student has been … "Taking Marla Thompson's Public Speaking class. She helped me come out of my shell. Believe me, I did not want to talk in front of a large group of people! I felt like I gained intangible skills taking her class." To him, greatness means … "Waking up every morning and moving forward to accomplishing your goals." People would be surprised to know ... "I was diagnosed with cancer (CNS lymphoma) when I was 2. I did a year of chemotherapy and have been in remission ever since. I strive to be my best and to prove that I have a purpose and that I am no different from anyone else. Even through I still struggle with things, I do the best I can to make my family and friends proud. That's one of the reasons I ran for Homecoming King." In five years ... "I see myself teaching and continuing my education as I pursue a master's degree so I can become a school administrator and perhaps athletic director."